From Shawn Soh’s bookshelf to April Hannah’s table set, tree-shaped decor appears to be having a moment. Another fan of the arboreal trend? Greenpeace China, which has been actively calling upon book publishers in the region to use ancient-forest-friendly paper. To help promote the environmental group’s “Book Lovers for Forests” campaign, award-winning designer Jamy Yang created a bookshelf that doubles as a promotional display for participating bookstores. 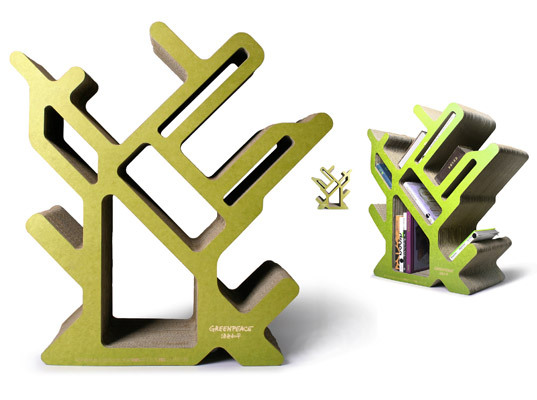 Naturally, Yang’s “Creative Action for Forest” bookcase is made from recycled cardboard, but the abstract tree design has a purpose beyond the latest design meme. By linking trees to books, Yang wants to equate the idea of using recycled paper to tree-planting. Way to see the forest for the trees. Could you please provide info on where to find this bookshelf? You've posted other tree bookshelves and when you click on the links there are error messages or no real contact for actually purchasing the bookshelf. Either that or say if it's not available for purchase yet. From Shawn Soh's bookshelf to April Hannah's table set, tree-shaped decor appears to be having a moment. Another fan of the arboreal trend? Greenpeace China, which has been actively calling upon book publishers in the region to use ancient-forest-friendly paper. To help promote the environmental group's "Book Lovers for Forests" campaign, award-winning designer Jamy Yang created a bookshelf that doubles as a promotional display for participating bookstores.